Happy Holidays! Can you believe there's only 12 more shopping days before Christmas? Do you have people that are tough to buy for or do you need some quick and affordable gluten free gifts? These beautiful recipes in jars, candies and snacks are perfect for a hostess or something sweet for loved ones and neighbors. 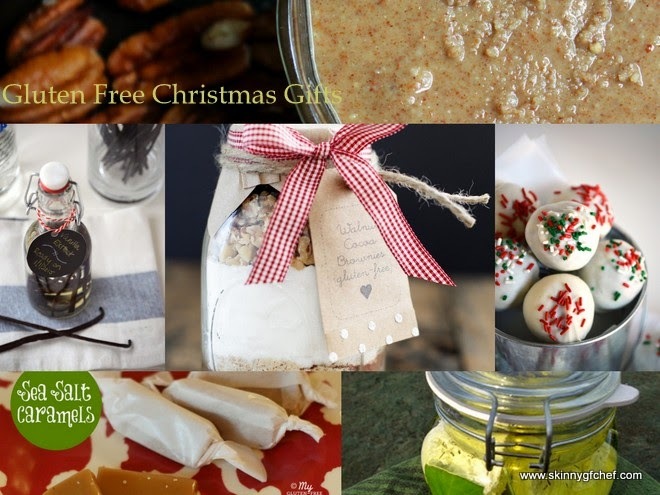 Hope you enjoy our best homemade gluten free gifts that won't break the bank and are easy to make! Roasted Sweet Vanilla Pecan Butter -pictured above. Gifts in a Jar: Last minute Food Gift Ideas ,Strawberry Rose Hip Jam and Peppermint Foot and Body Cream! -that one is on my list! Easy Salted Butterscotch Truffles and Gluten Free Peanut Butter Chocolate Fudge. Sweet Heat Snack Mix - one of my favorites! Gift in a Jar: Walnut Cocoa Brownies - Note- I made several of these for gifts and worked up a batch for myself. For mine, I reduced the sugar to 1/2 cup and used 1/2 teaspoon NuNaturals pure white stevia powder and they turned out great! Sea Salt Caramels-pictured above. These are sure to impress. Rebecca's Chocolate Buckwheat Mug Cake Recipe! Homemade Chocolate Syrup and Christmas Caramel Popcorn! Yum! My husband is a caramel corn nut. I'll be making him some of this instead of that awful stuff in the can. Shirley knows how busy we all are. This is a great recipe for those of us running around like chickens without a head. I'm going to fire up the crockpot and let it make pumpkin butter while I wrap presents. Everyone loves Chex mix! The bag they sell in the stores is not gluten free so I will be making this recipe. I made Chex Muddy buddies today too. Both are perfect for gifts and parties. Sweet Ginger Sriracha Roasted Cashews- Oh my..must make these too! No Bake Sugar Free Almond Joy Bars- I love these recipes! So easy and sugar free. I going to make them for myself! Gluten Free and Dairy Free Peanut Butter Balls -don't these look great? The perfect gift in a pretty box for someone who can't have gluten or dairy. Thank you so much to everyone who contributed to this list. 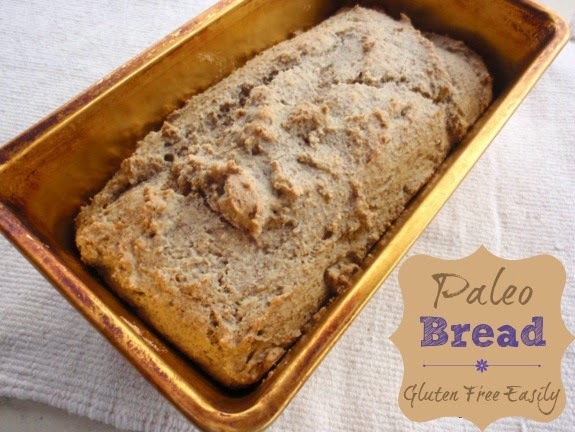 You are all amazing gluten free cooks and I feel confident sharing your recipes with my readers. Please feel free to leave more holiday recipes and gifts in the party below! Ok, that was fun! Now on to Savoring Saturdays Linky Party where we can find even more great recipes for our holiday menu! 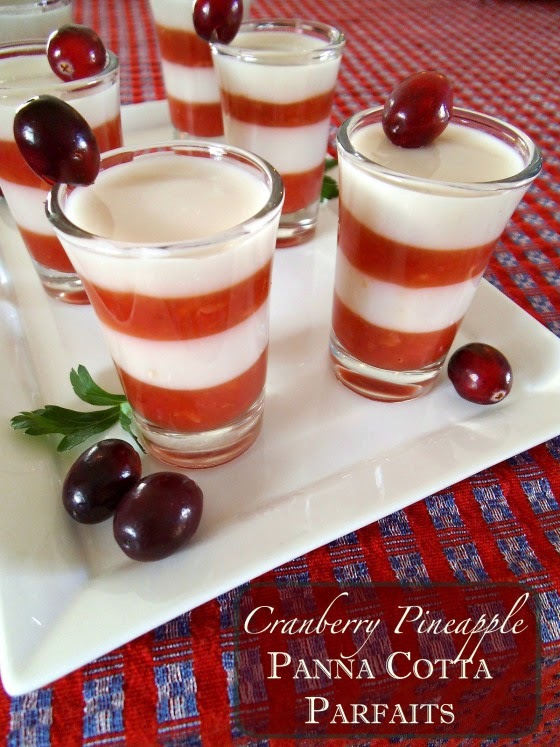 Cranberry Pineapple Panna Cotta from Swirls and Spice If you've never made Panna Cotta you are missing out. This recipe is perfect and I wouldn't change a thing. 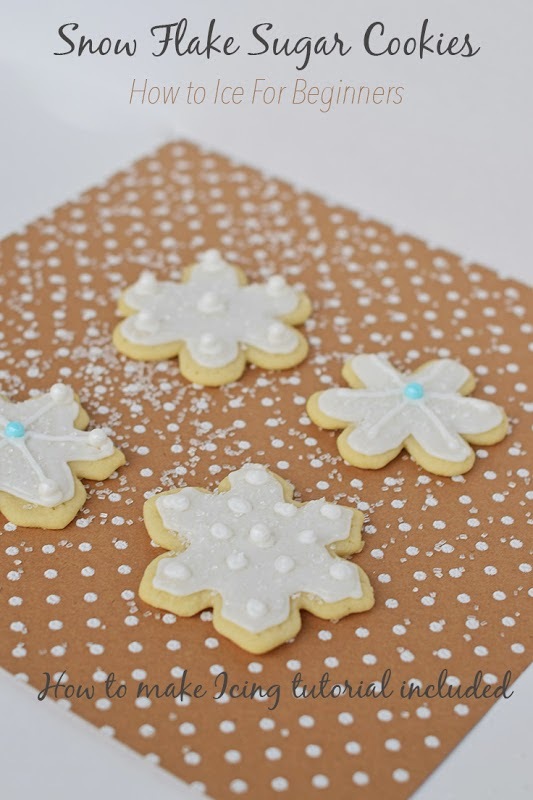 Snowflake Sugar Cookies: How to make icing and decorate from Major Hoff take a Wife. I love her artistry. Now I know how to ice a cookie and make it beautiful. Warm and spicy soup with Paleo Bread? Yes, please! Thanks Shirley for warming us up! 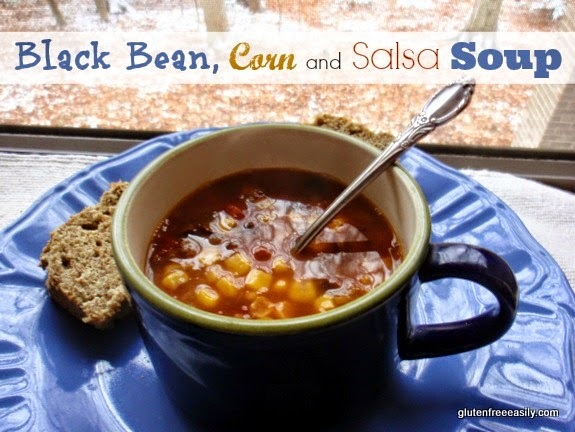 "Pantry Black Bean, Corn and Salsa Soup with Gluten Free Paleo Bread from Shirley at GFE! Great job Shirley. Your bread looks awesome! Thanks for the party Ladies! Love the features this week! Thanks for including my recipes Ali! Sharon, you have beautiful recipes and it was my honor to share them! Happy Holidays! This week after a false start (forgetting the rules) I've linked up a veggie dish that kids and adults love, Candy Carrot Coins, and my latest recipe Paleo Banana Chocolate Chip Pound Cake. I don't *think* I've linked up the latter before. It's been a busy weekend and I'm having a hard time keeping things straight obviously! LOL Thanks so much for hosting, Ali! I love your recipes Shirley and can't wait to try your bread. Yes, crazy busy time of year and I'm late responding due to shopping, cooking and loss of brain power! Merry Christmas dear, have a wonderful holiday!